The first dragonfly of the year appeared in my garden last week, and posed for me while I snapped several photos. This weekend, at our jewelry show, a dragonfly flew into our tent and then couldn’t find its way back out until I had unzipped several sections and offered a bit of guidance. And then it was free. I’m exhausted this morning. 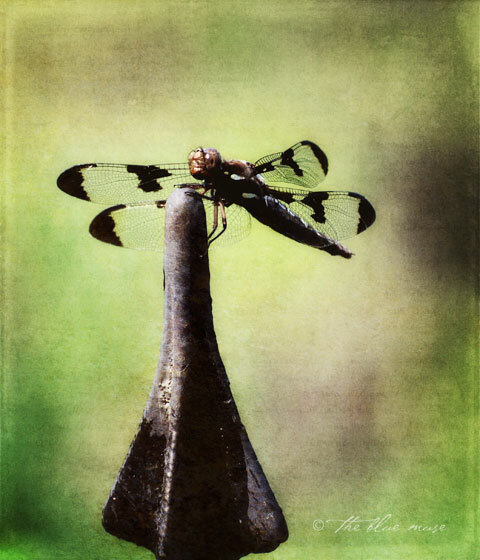 Hanging on like this dragonfly, still and ready to fly if necessary, but grateful for the brief rest. The sun is shining, the birds are singing, the scent of roses and peonies drifts in through my studio window. I’m trying hard not to be in a bad mood. The not being able to run is making me grumpy in more ways than I had anticipated. Or maybe it is just life making me grumpy. Or hormones. Or all the questions that keep buzzing around in my head. Questions that always flit away before I’ve read their answers. I keep living the questions, buzzing around on them, with them, over them, under them. It makes me dizzy. When I stop for a moment, cling to something strong and steady, I see that the answers are never really hidden, they just move faster than I do. I only have to pause for a second to see several of them zooming by. Just now, I’m going to let them go, without even trying to read them as they fly past. I’m going to enjoy this sunlight and soak up something that feels like wisdom, although it could just as easily be trepidation. I’m thinking it’s a good thing, in this life, to be stubborn. To hold on. To refuse to give up. Learning to fly comes naturally for birds and dragonflies. Less so for humans. But I keep flapping away, all the while losing my balance, regaining my footing, fluttering and floating on breezes and happenstance. Today, I’m going to walk. I’m going to sink into the gravity that anchors me and feel its pull. I’m going to enjoy the warmth of the earth beneath my feet. And already, I feel light as a feather. This entry was posted on Monday, June 6th, 2011 at 9:55 amand is filed under . You can follow any responses to this entry through the RSS 2.0 feed. You can leave a response, or trackback from your own site. “soak up something that feels like wisdom . . .” Perhaps it is good to “soak it up” and resist feeling a need to define it. Holding fast to your principles isn’t stubborness. And isn’t writing such good therapy? Great post, I was out on the boat with my husband yesterday and the dragonflies were flying along with us, it was beautiful. Dragonflies are a sign of good things to come – acadien culture-Joy in Japanese-have survived 300 million years of evolution-they carry messages of wisdom,awareness & insight and call on you to seek out negative habits & limiting beliefs you are carrying which are destructive & disempowering…look within with honesty & love – It is believed that dragonfly encourages us to accept that anything is possible ~ your reality is yours to create. ` inspiration to learn the practice of shedding -mirroring of light in our own lives ~ sparks the creative power of imagination. just some of the words I wrote down – first tattoo age 51 truly believe in dragonfly magic. too cool, I have a copy of your golden dragonfly print here in my room & it adds charge to my own power. This is a wonderful capture here. But I’m especially glad to hear you’re light as a feather – and walking. I love that. Not so alone anymore. Thank you for writing what I feel everyday. Beautiful imagery, Kelly. You’re not alone in feeling this way but please be assured that you are loved and that we are all rooting for you so please do take that time and soak up some happiness; you’re nothing but deserving. Love it… because I’m flapping, really fast. You are truly gifted my friend! it sounds so simple when you put it like that . . .
yes. walking always soothes me when the anxiety starts to take over. gorgeous photo too!